Freemius, Inc. is an authorized reseller of “Helpie KB” and is the 'merchant of record' for your purchase. The agreement is between you and Freemius, Inc. on behalf of the Vendor behind “Helpie KB” (the “Vendor”). You may not assign or transfer it without Freemius’ express prior written consent. 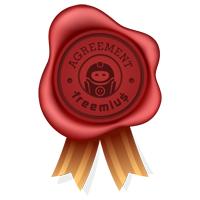 Freemius, Inc. resells and distributes “Helpie KB” and other plugins and themes "as is" and with no implied or statutory warranties, or guarantees that they will function exactly as you would like, or that they will be compatible with all third-party components and plugins. Product security and feature updates are included for free as long as your license is active. Updates will be delivered automatically from the WordPress admin dashboard or you can manually download the latest version of the product from your dashboard: https://users.freemius.com/store/1036/login/. The product’s license is sold as automatically recurring subscriptions that renew each year on the anniversary of the purchase date. All subscriptions automatically renew at the end of the annual license term unless You cancel the subscription prior to the automatic renewal date. Prices of “Helpie KB” are subject to change without prior notice or consent. If, during the first 30 days following the Purchase date, You experience a defect that makes the Product's material functions unusable, and following Your cooperation with our support team we are unable to resolve it, then following Your request we will issue a full refund of the Purchase price. For clarity, any defect or lack of use arising from a conflict or incompatibility with a third party product, is not covered by this policy, and nor are missing Product features.